Jan. 18, students who represent the Student Labor Action Project protested the university’s take-away from student food service workers in Hamilton dining hall. For years, Dining Service managers gave a free meal to each worker during their shift as part of their overall compensation. The practice is a common one in private sector food service establishments, because it is incentive for their workers. During the summer, while most students were away, dining managers took that away from student workers, moving forward with a plan to get rid of free meals. People who are students and others who are union members largely interpreted the action as an attack that serves only to divide students and classified workers. Students recognize the unfair take-away and protested in Hamilton Dining Hall for close to an hour, complete with signs, banners and chants. 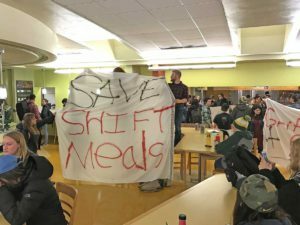 The protest was well received by students and they understood the message—challenge UO Dining managers to treat students fairly. This issue is on the table during our bargaining sessions, which are ongoing. Stay tuned in to learn about opportunities to stand with and support the people who are our student co-workers. We need to move forward.